Live like royalty in the charming island of Sicily, where the Mediterranean Sea lures visitors with its decadent temptations around every corner. 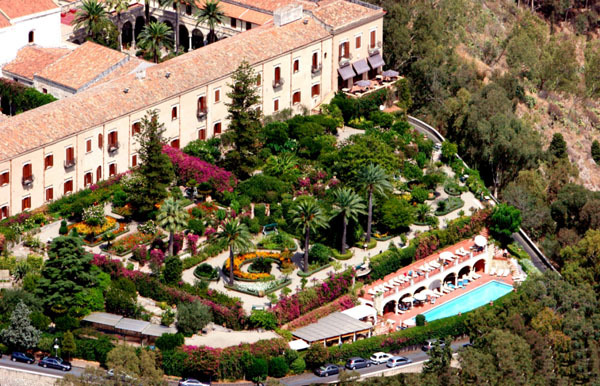 Situated in the charismatic hilltop town of Taormina—a popular summer destination resort town, stands the imperial San Domenico Palace Hotel. Built on the original structure of a former Dominican Monastery of the 15th Century, this hotel is rich in luxury and history. Giovanni Rosso, Prince of Cerami, a descendant of Damiano Rosso, and a Catanian nobleman of the princely family Rosso di Altavilla who built and then donated the monastery when he embraced the monastic life transformed the monastery into a hotel in 1896. Now this luxury hotel boasts its ancient walls that whisper about the years before and recalls the monastic life. Since the beginning the San Domenico has attracted poets, writers, movie stars, royal families and Heads of State to visit and enjoy a segment of sumptuousness, to inspire and excite their imaginations. The 102 bedrooms are split between the monastery wing where the monks living quarters were originally based and the grand wing—the newer part of the hotel. The classic rooms overlook the ancient cloisters of Taormina, while the superior rooms boast breathtaking sea views. Deluxe rooms, in the grand wing offer the best of both worlds with Seaview and balcony sights for those perfect sunset afternoons. Whether you choose the historic wing or the liberty style grand wing, all the rooms are comfortably furnished in a style reflective of the hotels history—each room charms with luxury and invites with comfort. From the moment you step into the executive suite, your eyes are delighted with gold tones, contrasting with royal red aspects in the curtains, furnishings and bed linen. The large white doors open up to your very own private balcony, with stunning views of the sea and comfortable day bed with a table for food and beverages. To add that extra touch of royalty, the Suite Terrace includes its own mini pool, for those days here you want to relax in the pool, drink your mojito and revel in the dazzling views of the blue ocean. As expected, the hotel proposes three outstanding restaurants to delight any palate. The Principle Cerami is a 2 Michelin star restaurant, run by Chef Massimo Mantarro, who brings a Sicilian touch to refined haute cuisine, in a magical atmosphere overlooking the Ionian Sea. If you are looking for a more diverse range of dishes, the Les Bougainvillées is open all year round and serves Sicilian specialties as well as classical international dishes. Guests can unwind and dine on a beautiful terrace overlooking the sea with welcome shade under a floral trellised pergola adjacent to the swimming pool. Guests can indulge in the fresh catch of the day or dine on regional seasonal Mediterranean dishes. For a formal and fun evening, the hotel offers a range of bars, including the pool bar, which is set in the refined courtyard of the hotel. This elegant space is occupied by intricate patterns from the chairs to the buildings architecture, including the archways and fountain. This is the perfect spot for enjoying a glass of wine to admire the majestic sunset. A stay at the San Domenico Palace is an irresistibly pleasurable experience offering warm sunshine amidst the bright colors of Sicily, the fresh fragrances of flowers, and the spritely twitter of nature. You will find yourself contemplating the beauty of this magical place, its history and what secret memories it may keep.